by Friday to be entered. At BRD Sport, we really hit the ground running after Thanksgiving and have not stopped yet! This time of year it is always a challenge to fit in everything we need – and want – to do. Holiday festivities are just the most anticipated events of the year…family and friends surrounding you, sharing the joy of the season…and gift-giving is such a fantastic tradition…time well spent! But when there is so much fun to get to, it can be even more difficult to make time for your fitness regimen…which is not always acceptable for those of us who enjoy the routine and gain satisfaction in the challenge our daily activity brings. So, as always, BRD Sport is here to help you reach your goals as simply as possible…without any extra thought. 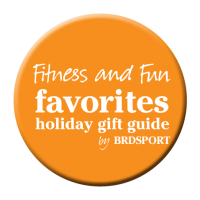 Ok, so we can’t run for you and we can’t hit the office party, but if nothing else, let us make your shopping an easy, hassle-free, pleasant experience with our first ever BRD Sport “Fitness and Fun Favorites” Holiday Gift Guide…here goes! Now on to the rest…. Soleus GPS 1.0 Sport Watch Our favorite of the GPS watch variety, lightweight, accurate and well-priced, the Soleus 1.0 (available at www.holabirdsports.com) monitors your time, distance, pace and calories. Times are stored in memory so you can review and analyze the data and utilize in improving your performance. 1BandID A lifesaving safety device for all runners, cyclists, hikers, and swimmers, the 1BandID can be laser-engraved with your emergency contact and medical information. The tag is lightweight and can be attached to your watch or GPS. IBandID.com is generously giving away a free ID to one lucky winner among BRD Sport’s friends. Like us on Facebook or follow us on Twitter to become eligible. 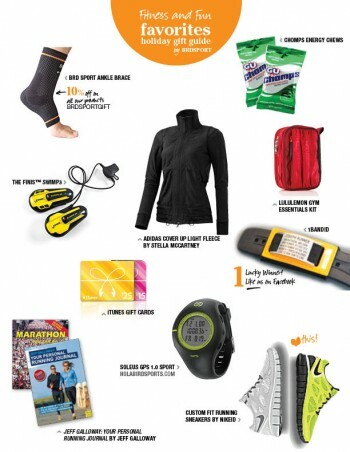 Chomps Energy Chews Stocking Stuffer for your triathlete! A diversion from more typical, on-the-go replenishment gels, Chomps are packed with carbohydrates, amino acids, Vitamin C, E and antioxidants that combat tissue breakdown. Sodium and potassium to restore electrolyte balance. Yum and good for you!! Lululemon Gym Essentials Kit This kit, is packed full with all you need to freshen up post workout yet small enough to fit in any gym bag. It has a stowable hook to hang your kit up in your locker or behind the hotel bathroom door; removable pockets in which to pack liquids; and (our favorite!) an emergency hair tie to the rescue! The Finis™ SwiMP3 Exclusively for swimmers and underwater sports enthusiasts, this MP3 has no headphones or wires and delivers the music come loud and clear through the cheek bones. Awesome! Custom Fit Running Sneakers NikeiD is among the best vendors who provide this awesome, very personal service. Running Journal An excellent way to stay motivated and on course, there are a bevy of journals available, but our favorite is Jeff Galloway: Your Personal Running Journal by Jeff Galloway. Galloway’s book Marathon You Can Do It! is another great book for your hopeful marathoners, mapping out training methods and offering inspirational tips and advice to set and reach one’s goals. Adidas Cover Up Light Fleece by Stella McCartney Super stylish while on the go! The two-way zip and tie-cord hem of the adidas by Stella McCartney Cover Up Light Fleece jacket lets you ventilate on the go. Gift certificates An evergreen favorite – how about to a favorite, local, top-notch personal trainer; Tennis or golf lessons with the club pro; iTunes for an upgrade to runner’s 2012 training playlist. Enjoy the season. Stay active and engaged…. And Happy Shopping!